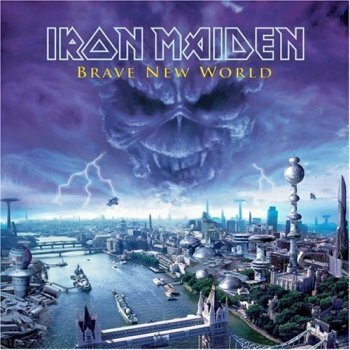 Brave New World is the twelfth studio album by Iron Maiden, released on 30 May 2000. It marked the return of longtime lead singer Bruce Dickinson and guitarist Adrian Smith to the band, who left in 1990, replaced by Janick Gers. It was also the band's first studio recording with three guitar players, as Gers stayed with the band after Smith's return. The album art and title song are references to the novel of the same name written by Aldous Huxley. The upper half of the album art was done by Derek Riggs, and is the last new artwork done by Riggs to be used on an Iron Maiden release. The bottom half was done by digital artist Steve Stone. The Similarly, the line 'Brave new world' is repeated in the pre-chorus in an earlier song by the band, "Stranger in a Strange Land", from Somewhere In Time. The songs "The Wicker Man" and "Out of the Silent Planet" were both released as singles. "The Wicker Man" was released in the U.S as a promo single with extra vocals in the chorus. "The Nomad", "Dream of Mirrors", and "The Mercenary" were originally written for Virtual XI, according to Adrian Smith in an interview. He said there was a fourth song, but he didn't know which one it was and that Steve Harris did not remember either. Apparently, former singer Blaze Bayley also co-wrote "Dream of Mirrors", but wasn't credited. At the end of the song "The Thin Line Between Love and Hate", there's a recording of a small conversation at the studio. Brave New World Tour was the tour supporting the album. 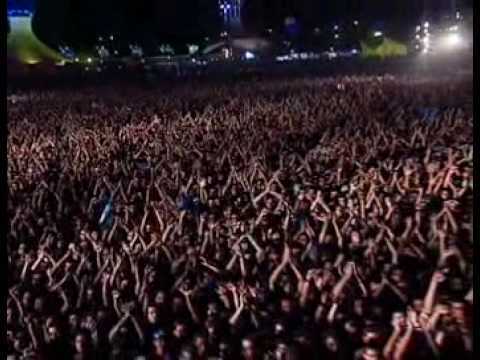 During the tour, the show in Rock in Rio was released as a live album. The song "Brave New World" was covered in 2008 by Ghostlines on the tribute CD Maiden Heaven: A Tribute to Iron Maiden released by Kerrang! magazine.